One character per person. Anyone can join. The guy is an up incoming author. Limited to 3 people that can join. Amelia sighed, her head propped up against her palm as she stared out the window. Same people. Same lame job. She hated it. She was used to her routine. Get up, dressed, work and sleep. Her phone rang, breaking her from her trance. She reached over and grabbed it, putting a smile on her face. "Hello, you've reached Crystalic's Publishing, my name is Amelia. How may I help you today?" Her smile quickly faded when she heard the voice on the other line. "Oh, hey mom...Uh...my cell? I had to start turning off when I'm at work. Yes, yes...I know mom." She placed her hand on her forehead. Her mother had been constantly nagging her to settle down with a nice guy, most of the time one she had arranged. "Look mom, I'm not supposed to take personal calls. I'll call you later. Love you." And with that, she hung up. She covered her face and shook her head. As she stood up, she looked around her small and average looking office. She worked five days a week, sometimes til near midnight editing books. She didn't have time to meet anyone, much less date them. But, she was in her late twenties. It wasn't like she hadn't considered finding someone special. Then again, she never had much luck with guys in the past. She picked up some paperwork and headed out to the copy room. It was late. Most of the staff had left already. Once she made the copies and sent them to the writer, she would probably leave too. Her writer was making her work harder. She hated working with this man, though she hadn't met him in person. She had talked on the phone with him many times. 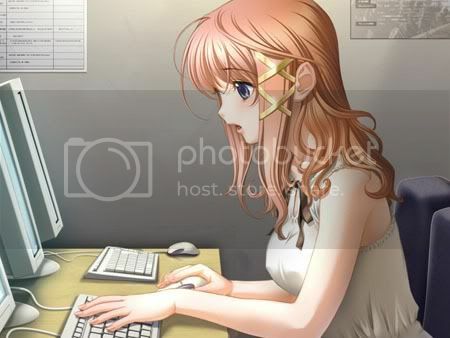 She sighed again as she entered the copy room and started making copies of her edits. All Amelia knew about him is that he was in his early thirties, lazy and worked whenever he felt like it. Guess that was the life of an author. They figured they could create their own work schedule and didn't give a damn about their editors. She walked over to the fax machine and typed in his number to send the copies. "Huh?" It had failed to send. She tried it again, but it failed. "Great." Pulling out her cell, she quickly dialed his number and gave him a call. No answer. Just voicemail, which happened a lot more than they had actually spoke. "It's Amelia. I'm unable to send you the edited pages. I'll drop them off in your mailbox in about half an hour. Please get your fax machine fixed." She hung up. At least his place wasn't too far off from her own route home, but it was still a hassle. She pulled up into the parking lot. It was an average apartment building for someone with low income. Maybe if he actually did his work on time for once, he could make money a bit faster and move out of this dump. She sighed, turning off the engine and opening the door. She locked it and headed up the stairs. "Let's see...1A...," she said to herself as she looked at the numbers on the doors. When she reached his apartment, she looked at it for a moment and debated to knock. Maybe his editor giving him an earful in person would change his attitude. She decided against it and reached into her bag. Pulling out his book, she placed it in his mailbox. She took one more look at the door, then began to walk away.